The Winter Olympics in Sochi will be the most expensive ever organized, not only because they are to be held in a place with a sub-tropical climate, the warmest ever to have hosted the Winter Olympics, but also because they are the product of an “infinitely corrupt” system. This is what emerges from The Sochi Project , a report resulting from 5 years' work by Dutch photographer Rob Hornstra and writer and film director Arnold Van Brugen. The project was presented at the Amsterdam International Documentary Film Festival 2013, IDFA , in the interactive documentaries section, Doc Lab , and includes an exhibition and a book, An Atlas of War and Tourism in the Caucasus. The XXII Winter Olympic Games will take place between the 7th and 23rd of February, together with the Paralympics. Sochi was chosen by the Olympic Committee in 2007 in Guatemala City, where Russia was able to assert its candidacy over that of Austria (Salzburg) and South Korea (Pyeongchang). The Olympic Park, to host competitors and spectators, is situated 4 kilometres from the border with the self-proclaimed republic of Abkhazia, recognized by Russia after its conflict with Georgia in 2008, but which, according to Tbilisi, is still part of Georgia. The Sochi Project describes the overall background, placing the Olympic event in its Caucasian context with an analysis covering the history, politics and geography of the region. The centre of the documentary, however, focusses on the issue of human rights: outside the Olympic enclosure, in fact, human rights are worth little, and, since Russia won this candidacy, they seem to be valued even less. The terrorists too have increased their threats and attacks. Doku Umarov, self-proclaimed leader of the guerrilla war against Russia and its allies, referred to the Sochi Olympics a few months ago in a message in which he asked all militant Islamists to stop the “Satanic Games”, and Caucasian militants involved in Syria are returning to the area. The analysis of the next Winter Olympics, however, draws our attention to yet another aspect. 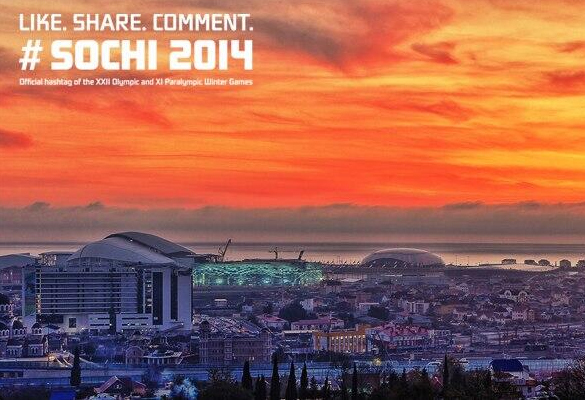 Sochi had not one structure in condition to host the Games. Everything has been built from zero: the buildings due to hold the skating events, for example, are extremely modern, looking like space ships, and “the most expensive road in the world” has been built to link Sochi to the ski slopes in Krasnaya Polyana. But, most of the workers employed here have no contract, work in appalling conditions and often are not even paid. The Serbian agency says it is mainly the subcontractors who impose these pressures on the workers. The recruitment and blackmail seem to be increasing as the need to complete the work in time for the inauguration grows. Hornstra and Van Bruggen show that the overall cost of the Games is now 4 times the initial estimate (12 billion euros), being over 50 billion. Before Sochi, the most expensive Olympics ever held were those in Beijing in 2008. Sochi has exceeded this record, despite the Winter Games being smaller than the summer ones. Boris Nemtsov, a local opposition politician, interviewed by the Dutch journalists, has supplied an explanation for this record. It is normal, he says, for the costs for such an event to double, such that an initial budget of 12 billion becomes 24. But the other 26 billion are absorbed in corruption. Mechanisms are explained to The Sochi Project by a local entrepreneur. In Moscow a firm with good political connections wins a contract. This firm then subcontracts to another firm, often Turkish, which is more efficient and cheaper, withholding the difference. So the chain continues, with money creamed off at every stage. At the end of the chain are the workers in conditions of semi-slavery. Hornstra and Van Bruggen interviewed several of them, some in 2010 after one of the building workers' major revolts. The photos of their living conditions are eloquent enough. One of the principal beneficiaries of the Games seems to be the President of the Russian Railways, Vladimir Yakunin, who won the contract for building “the most expensive road in the world” from Sochi to the Krasnaya Polyana ski slopes, 48 km, costing 6 billion. Neither has the environment been spared in the region's precipitate development aimed at ensuring the facilities are ready for the Games. Local ecologists told The Sochi Project that several rivers have been diverted, ski slopes have been constructed on sites protected by Unesco and refuse tips made in vulnerable areas.